Former IBM Chairman of the Board, Thomas J. Watson, was once quoted as saying “I think there’s a world market for about 5 computers.” Of course this was back in the late 1940s, when most mainframe computers still required a small gymnasium to be housed in. I recently went searching for this quote to serve as a companion for the image posted below. For those that haven’t seen the image before, it is not real. 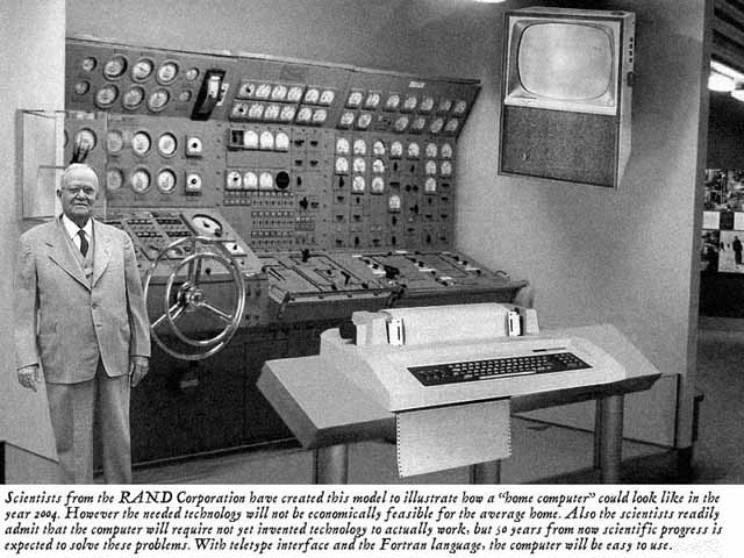 Rather it is a “photoshopped” image that uses a replica of an original U.S. Navy submarine control panel, a console television from the early 50s, and a random suited man all thrown together in an attempt to poke fun of the way people once envisioned the direction of technology. The joke isn’t so much that a select few people would enjoy having such a large home computer complete with an interface only possible through a complex programming language. The real laugh is that many people today view technology predictions from the past as somewhat laughable, even going so far as to poke fun by way of farce. How humorous it is today that I’m writing this thought on a computer no larger than a college textbook at my kitchen table, when 50 years people might have predicted I would need a machine the size of my living room to do so? Where am I going with all this? If our vision of technological progress 50 years ago, or at least our “revision” of that progress is a bit underwelming, would we do a better job of predicting computers of the future given our experience with microcomputers, cell phones, and portable digital music players? I’m going to ask my students this week, since we’ve been using our laptops all year. I’ll be using the IBM quote as a prompt as well as some images of the original UNIVAC computers and ENIAC to help show how computers and technology have changed in the last half century. Perhaps they’ll have some interesting predictions to make, or some blunderous ones. My guess is all of their ideas will outshine at least one former IBM exectuive’s thoughts. Special thanks to Mike Champion for sharing this image and getting me thinking. Previous:1st Anniversary Grab Bag Podcast!